Use Smart Card to listen to the verses' esplanations (Ayah's tafseer) in Arabic, English and the following languages: French, German, Spanish, Russian, Turkish, Chinese, Malay and Urdu.. Choose to listen to famous reciters in any of the following narrations (Rewayat): Hafs, Warsh and Qaloon. Lithium Battery and charger included. 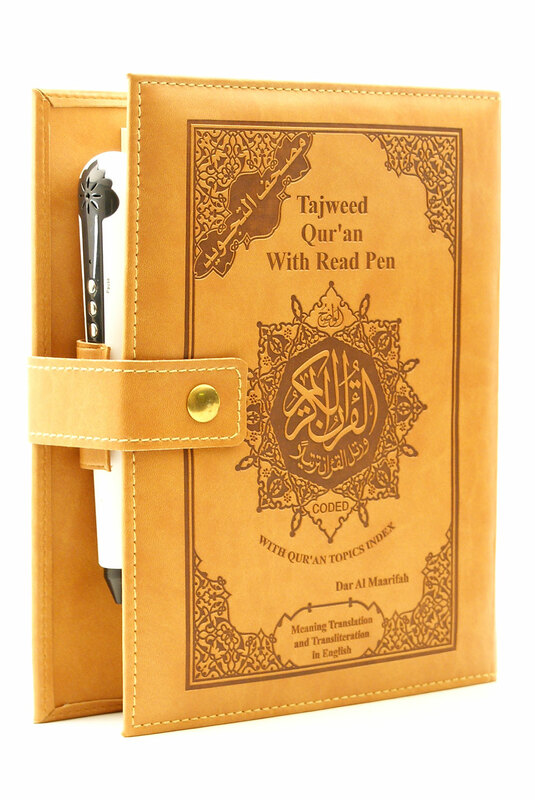 This version of the Quran comes with the Meanings Translation into English, and Transliteration, it is a great help for non Arabic speakers learners and reciters, the translation will help in understanding the meanings of the Ayas (verses), and the transliteration will help in learning the recitation of the Quran, you can use the read pen to listen to the Aya then try to recite as heard, following either with the Arabic text or the English transliteration. The colour coded Tajweed rules will make recitation in Tajweed much easier. 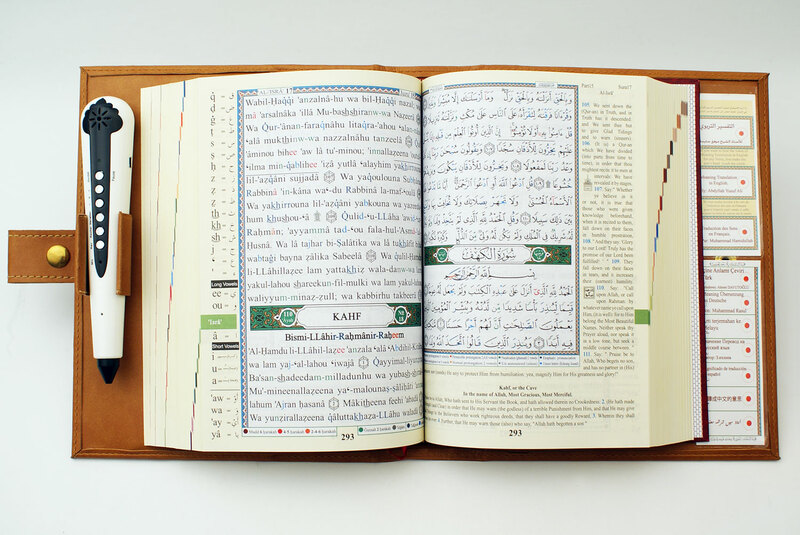 All Tajweed rules are explained at the end of the Quran, beside other useful indexes such as the subjects' index. With the read pen, you can choose your favourite reciter and/or narration (riwaya), listen to the aya, record your recitation, and play it back to correct your mistakes. Read and listen to the Quran's verses with tajweed rules. Meaning translations on the margins; and transliteration pages are in English language. Smart Card to listen to verses' explanations (Ayah's tafseer) in Arabic, English and the following languages: French, German, Spanish, Russian, Turkish, Chinese, Malay and Urdu. Choose to listen to Quran recitation in the voice of five of the world's most pupular reciters: Menshawi, Lahoni, Sudais, Ghamidi and Huthaify. Really glad with the product, it is AMAZING!